West Palm Beach, FL – Following decisive direction from Gov. Rick Scott and an emergency order issuance by the Florida Department of Environmental Protection, the South Florida Water Management District (SFWMD) today implemented an array of new actions adding to current efforts already underway to lower lake levels and move more water into the conservation areas caused by record May rainfall. These measures, which would have been slowed by typical agency approval processes, will now move forward on an expedited basis to help reduce the severity of and need for flood releases that the U.S. Army Corps of Engineers (USACE) is making from the lake to the northern estuaries. "We are taking every opportunity to remove water from the conservation areas through our regional flood control system," said SFWMD Governing Board Chairman Federico Fernandez. "These measures, combined with necessary actions by our federal partners, will help reduce the water levels caused by the record-setting rainfall we have seen so far this wet season." Record rainfall in May dropped more than 300 percent of the average monthly rainfall across South Florida. This rainfall caused the lake to rise more than a foot prior to the onset of the wet season, which led the USACE to begin releases from the lake on June 1 to the northern estuaries to ensure flood protection for the citizens that live south of the lake. At the same time, this record rainfall inundated the water conservation areas, causing them to rise above their regulation schedules. Installation of temporary pumps near the S-39 Structure to move additional water out of Water Conservation Area 2 to the Hillsboro Canal on the Palm Beach-Broward county line, creating capacity in the conservation area. Installation of temporary pumps at the S-151 Structure to move an additional 200 cfs of water out of Water Conservation Area 3A in Miami-Dade County. Operation of the S-152 Structure to move 400 cfs out of Water Conservation Area 3A. Installation of temporary pumps at several locations in Broward and Miami-Dade counties that will move water from the conservation areas into the L-29, L-28 and C-4 canals. Watch Gov. 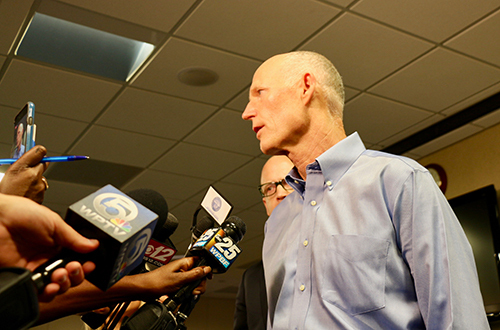 Rick Scott's press conference at SFWMD Headquarters. Read the Department of Environmental Protection's emergency order. Watch SFWMD Chief Engineer John Mitnik's video update about current water conditions and actions being taken to move water. Learn more about what SFWMD is doing to manage high water levels.